Cycling is enjoyed by millions of people around the world, whether simply as a means of getting from A to Z or for keeping fit. 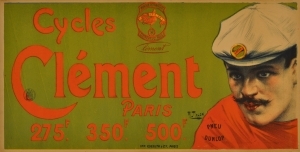 Since its invention in the 1800s, the humble bicycle has been the subject of many cycling posters, from the promotion of safer cycling to advertising events such as the Tour de France. Riding a bike is undoubtedly a liberating and healthy sport that can be enjoyed by the whole family. For those looking to improve their mood and general lifestyle, it’s also a good alternative to being stuck inside a train carriage during the rush hour commute to work. We stock a variety of original vintage posters which, like cycling itself, are very eco-friendly. These posters represent a moment in time and would look great on the wall of any keen cyclist’s home or office, as well as making an ideal gift for an enthusiast. Original vintage posters are also collectible items that are recognised as a sound art investment to be enjoyed as they appreciate over time. Below is a selection of original vintage cycling posters available to purchase online from our website with worldwide delivery. Visit our home page at www.AntikBar.co.uk to search by product (sport, advertising, travel), country or keyword to browse the whole selection. Please contact us if you have any specific requests or queries. James Bond is 007 – shaken, not stirred…! As fans of Ian Fleming’s fictional MI6 secret agent, James Bond, and his collection of classic cars and gadget-laden vehicles can rejoice at the extended opening of the Bond in Motion exhibition at the London Film Museum (and the widely anticipated opening of the next James Bond movie Spectre starring Daniel Craig), we take a look at some of the iconic movie posters produced for the 007 movies currently listed on our website. Please contact us if you would like any further information on our poster collection and if you are interested in any James Bond movie poster not currently listed on our website as our stock is regularly updated. We also provide a search on demand search service for individuals, interior designers and collectors looking for specific posters; most of our 007 film posters have been bought by individuals to decorate their cinema rooms and as gifts for James Bond fans, notable birthdays and children/teenagers. Win a copy of the catalogue for the “Kino/Film: Soviet Posters of the Silent Screen” exhibition in our caption competition, open from Saturday 15th to Saturday 22nd March. We will put all the best captions into a draw on Saturday 22nd March and contact the winner for their mailing address details. The “Kino/Film: Soviet Posters of the Silent Screen” exhibition showcases some of AntikBar’s original vintage movie posters from the 1920/30s alongside screenings of the silent films, open until Saturday 29 March at the Gallery for Russian and Design (GRAD) in London. Free entry. Click here for more information on the exhibition, including images, reviews and online audio guides. 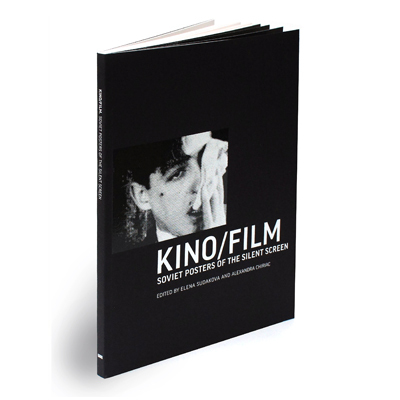 Copies of the Kino/Film exhibition catalogue are available to purchase at the gallery. The catalogue is a fully illustrated book that costs £25 and includes biographies of the poster designers and film directors.